White Dog Blog: Playing Fetch? With a Blind and Deaf Dog? Playing Fetch? With a Blind and Deaf Dog? Vinny's latest growth spurt seems to have slowed down a little bit. For the past several weeks, he has really shot up! He continues to enjoy learning new things and meeting new people and situations with confidence. He has mastered lying upside down in my lap to have all of his nails trimmed, as well as having his pads trimmed with an electric clipper. 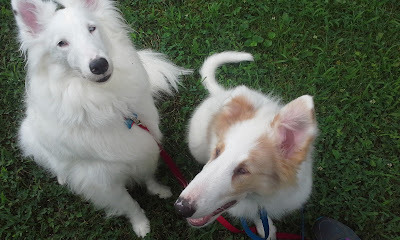 Collies have long hair that grows between their pads and keeping it trimmed ensures that his feet grow properly, he won't slip on slick surfaces, the house stays cleaner, and that he can feel various surfaces clearly, which is essential for him when he is making his way around in the world. He can tell where he is by changes in surfaces and textures. Interestingly, however, his behavior while being brushed still leaves a lot of room for improvement! He wiggles and wiggles. Somehow we manage to keep him looking brushed and presentable, and he certainly does better than he did in the beginning. It is a work in progress. Vinny has learned a tactile marker signal (a clicker touch cue) and I'm looking forward to doing some shaping exercises with him in the future. He gets so excited for food and gets frantic for it, so he cannot control himself or think very well when food first appears. Sometimes he still looks back at his shoulders when I touch him. I want him to focus ahead of him where the food will appear and not become frantic looking all over for it. We are getting close to that point. I don't want to start shaping until he truly understands where the food will appear. Lessons consist of sit, down, spin both directions, roll over, shake hands, and heel position by my left leg. Self control is an ongoing lesson and I am seeing gradual progress. Vinny often offers sits on his own now for petting, coming out of his crate and food. By VERY gradually prolonging those, he is learning some self control. I have to be careful though, because he can be sitting expecting something without me noticing and he can't see that I'm not paying attention. So, he sits patiently, and he may not get his reward. Our favorite game to play together is fetch. Yes, Virginia, blind and deaf dogs can learn to play fetch! The very first blind/deaf dog I ever trained taught me this. She was amazing and loved her toy. She would race out to smell the grass until she found it and come bounding back in my direction once she found it. Vinny is not quite that advanced in the game yet. But if I touch him with the toy and allow him to feel the direction I toss it, he knows to head in that direction and will sniff it out (only about a foot away from him at this point). Once he picks it up, he joyfully comes bouncing back to me with it. If I'm not careful he will bounce right into my face if I'm sitting on the floor! He is so happy to get back to me with it and we have a little game of petting and light tugging before I toss it again. 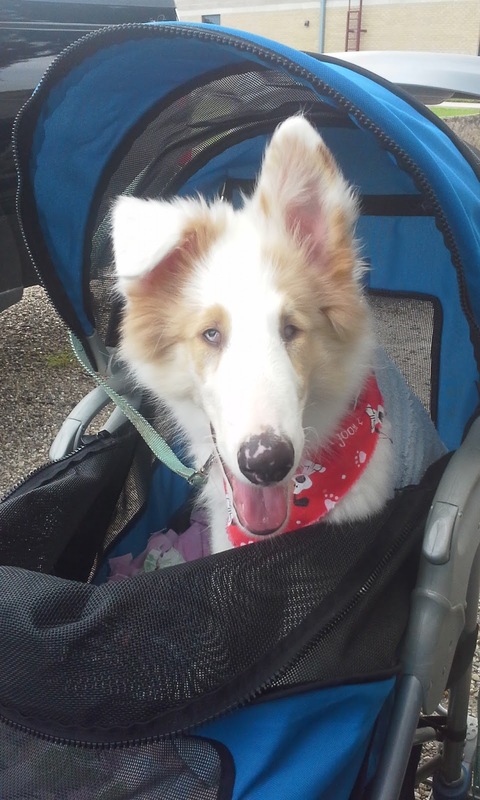 Vinny's biggest adventure this past week was learning to ride in Treasure's stroller for the Fair Parade. Right now he is still small enough to fit in it, but barely. He had to learn to remain in the stroller and not try to jump out. The pavement was too hot for him to walk, and he is getting too big to carry now. He did great! There were so many interesting smells - all the farm animals, horses up close, other dogs, people, food! So many children ran up to pet him as we walked by. I was very proud of him. But by the end of the parade, he was one tired pup! Hi - I am doing a blog series about specially-abled pets and would love to feature you. Please email me at thedailypip(at)gmail(dot)com if you are interested. Thanks!